Unwinding years of price gains as homebuilders try to make deals. The Commerce Department has reopened for business, and the good folks there are now in hyperdrive to put together and release the data that was blocked during the partial government shutdown that had also shut down the Commerce Department. This morning, it released the sales data for new homes whose sales closed in November. This report had originally been scheduled for the end of December. In the near future, the Commerce Department will further catch up and release the new-home sales data for December, which had been scheduled for last week. 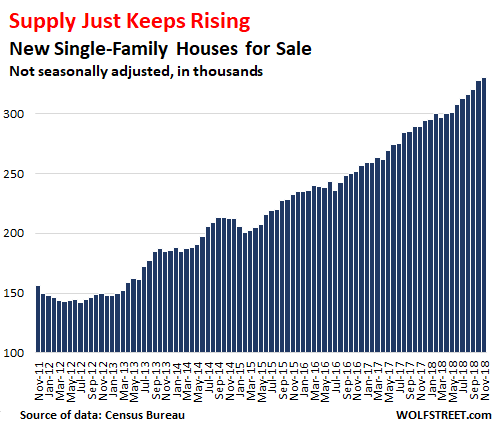 This new-home sales data – produced jointly by the Census Bureau and the Department of Housing and Urban Development – is very volatile, and subject to revisions in the following months. But after a while, and despite the jumpiness of the data, as the above chart shows, the trend becomes clear. What are the dynamics of this bedraggled market? 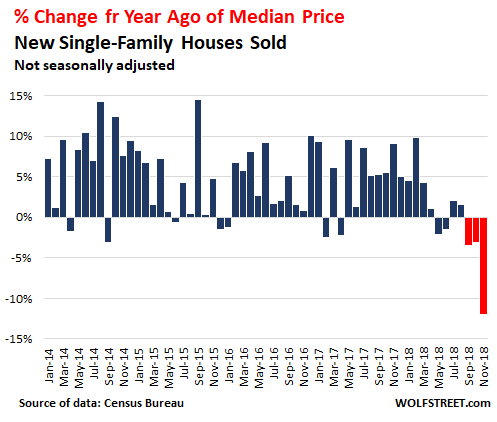 Though the median price of “existing homes” – single-family houses, townhouses, condos, and co-ops – in December was down 7.4% from the peak in June, on a year-over-year basis, it was still up 2.9%. And this, despite a 10% year-over-year drop in sales volume, the biggest such drop since May 2011. One of the major differences between the two is the entity that is selling these homes. New homes are sold by homebuilders. Existing homes are sold by regular homeowners and investors. The biggest homebuilders are large stock-market traded companies that have to maintain their sales momentum, no matter what. Through their reach across markets, they have good current market data and know where the market – the buyers – is going. And when buyers don’t materialize at a given price point, then incentives are thrown in, such as free upgrades in the kitchen, and eventually prices get cut a tad, and ultimately less costly homes get built to meet the buyers. A homeowner or investor who is not forced to sell might pull the home off the market if it doesn’t sell within a few months, and later put it back on the market, and dilly-dally around for years sometimes – though massive job losses, as they occurred during the Financial Crisis, can speed up that pace dramatically. By contrast, homebuilders have to make sales happen, no matter where the market is. They continue to build homes, and they have to sell homes whatever the market conditions may be. They cannot just wait for a few years until the market turns their way. And so they’re the first to adjust to the reality of the market. It’s hard to believe that this did not play into the Fed’s decision to be “patient” as he patient is dying. Recent new home buyers SCREWEEEEEDDDDDDDD!!! The first rule is always to buy when everyone else is buying, they can’t be wrong, right? Sure the prices are at a peak but this time is different(tm) and real estate only goes up! A bit of a slowdown is what was needed to keep wage growth in check. So, I would say that this is working and has worked. While I (if elected Fed Chairman) would have skipped that December increase, I think that the others were just fine. If sales start to pick up again, I would hit the market with another increase. If we drop another 10% in sales or 5% in price, I would probably drop the rate. But, then again, I haven’t been elected just YET. It worked? Wage growth just hit the highest year over year increase since June 2008, at 2.9%. I just don’t get these numbers. Does that mean everyone got a 2.9% raise? Some how I can’t believe this. Like all teachers, police, fire fighters, government workers, restaurant workers, butchers, and everyone? Some people must have gotten a huge bump because no one I know got any raise at all.. Seems like propaganda rather than facts.. Does that mean the person who pumps my gas got a 3% raise? The real estate sales people who are selling fewer homes? Wolf? What do you know about these figures? Maybe there are hedonic wage adjustments. If they upgrade the toilet paper at work, it’s like getting a raise. Better coffee is a big raise. …and then why are so many people working 2 or 3 jobs? Why do we want to keep down wage growth? That is the only thing that helps the working class. All other growth seems to be fine but never wage growth when it should be the opposite. Simple wage increases get eaten up by inflation and reduce competitiveness with overseas. The best way to help the working class is to upskill them. An engineer earns more than a mechanic and is more productive. Giving low-paid people a pay rise to spend on basics (and debt paydown…) does NOT result in inflation. Your type of ‘thinking’ sadly is what delivers us third-world levels of wealth disparity and social strife it causes. Business owners are shortsightedly worried about their bottom line, but if happy, well paid workers stay and produce more dols, what could be better? I guarantee that you will not be elected fed chairman. In fact, I guarantee that nobody ever will. Because the fed chairman isn’t elected. I heard Meng Wanzhou is buying. The west side of Vancouver is already down about 40 percent from the 2016 high. Of course no one can still afford anything there even with prices down 40 percent. – W. Richter could also use a 3, 6 or 12 month rolling average in the charts. That already would eliminate a lot of “jumpiness”. it would also mean not seeing the oncoming train until 3, 6, or 12 months post-trainwreck. Data smoothing is nice for understanding the past, but unhelpful for predicting the future. Yeah. But interest rates are down, and stocks are up, so with full employment, sales will rise again. I hate it, but it is what it is. The whole economy is manage by The FED, and It’s in to save the day. Sure, they’re pumping a bump, but how long will that last? Not raising rates shows that there’s weakness, and the realization of that will slump the bump. I can only hope…. it can’t happen soon enough. “0.0%” mortgages is a hard limit for the “housing wealth” game as confident homeowners will not qualify for NIRP mortgages. Secant, I’d put the practical floor for US mortgage rates at about 2.5%. Mortgage rates are always above ~10-year Treasury rates due to credit-quality differences, and 10-year rates stay above short term rates except when the yield curve inverts. Which is not where the Fed wants to go. We already had short rates at zero and mortgage rates never got below 3.25% (for 30-year) or 2.5% (15-year) fixed loans. One could squeeze rates a bit farther by making the terms far friendlier to the lenders: adjustable-rate, high-down-payment, full recourse, non-amortizing with balloon payment … but we tried that in 2005-2008 and it was a disaster. They will pay you -3%interest (adjustable at 2 year ) to borrow 500K for that monthly payment? The Census report is titled “new residential sales”. 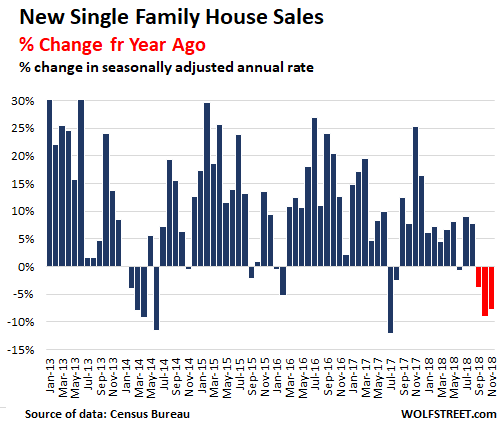 Not “New Home Sales”. Realtors and builders don’t actually sell homes, they sell houses. Home is what you put into the house, not the house itself. That’s why you can move without losing your home. Most owners won’t say “we sold our home”, they’ll say “we sold the house”, because they moved their home to a new house. They didn’t sell their home. See the difference? The industry sellers want buyers to think they’re buying a home because that word triggers emotions that they can exploit to earn more income. brilliant breakdown of that difference between house and home language. I found that very telling. thank you! 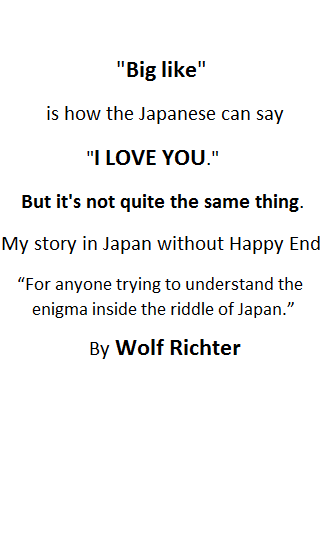 Wolf, don’t worry, we’ll forgive you! My deeper point is the insidiousness of the banker-friendly language used to frame the entire public conversation about anything related to business or economics. It’s demonstrably biased and yet hard to escape. In the spirit of your Fed Hawk-o-Meter, the count is 16 uses of “home” and only 8 of “house” in the article as a whole. And we all know the headline and tag are far more significant than the body, and within the body the intro sets the tone. So I stand behind my original comment. Other than that I thought you did a great job in keeping the article balanced and factual, typical of the WolfStreet style. But in that spirit, I’d like to challenge you (and help you) to find new phrasings that break readers out of the mental fog induced by the banker-friendly standard framing of the issues you cover. For instance, apropos of the prior article, why is a decline in pending “home” [ahem house] sales “uglier”? For those priced out of affordable quality housing, a decline in sales (leading as you’ve outlined to a drop in prices) is a welcome break from years of frustration! For owners battling rising property tax bills, a drop in prices is also a relief. A reduced sales rate means people are hanging onto their houses longer instead of flipping them; is that such a bad thing? Realtors won’t get their skim but that leaves owners with money for other, potentially more valuable uses. yes, houses became homes around the time health insurance became healthcare. You don’t know, it could be figures for homes that people have just made , which the banks have found a method of liquidating , sort of like “Buy with a vengeance, it’s like turning out unfriendly neighbours” or “Why should others have it cosy if you can’t, get even” . I wouldn’t put it past that lot. I’ve got you both beat. I insist on referring to them as shacks. Nationwide shack prices are about to skyrocket! Trust me, I have a PhD in shackology. I get a kick out of how Ben Jones over at HBB refers to houses as shacks, and realtors as used shack salespeople. It really takes the REIC down a notch. The National Association of Realtors has blamed high prices and increased mortgage rates for the lack of interest on the part of home buyers. But your chart from the census bureau shows that the median price of a new home sold is down 12%, they are on sale. And the one percent rise in interest rates over the last 12 has boosted the monthly payment by about $250/month, less than $200 after taxes. I believe a more significant factor, all but ignored by the NAR, is the new tax bill. For many potential home buyers the out of pocket cost due to clipping the State and Local deduction is much larger the interest rate effect. Lower median price doesn’t necessarily mean “on sale”. The “product mix” of sales matters. It could be that buyers are snapping up the cheaper “generic brand” houses (townhouses, condos) and avoiding the pricey custom large-lot single-family McMansions. Or builders have shifted production mix away from high-cost areas (shortage of buildable lots?) over to lower-cost areas. Agreed about the SALT deduction change impacting affordability though. Spoke to a woman from Knoxville Tn today. Her husband is a contractor who builds 18 homes a year. He has a back order of 40 to get thru. Seems all is well in eastern TN. 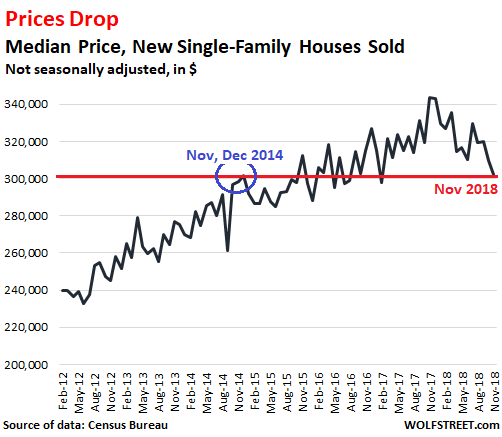 Wolf, maybe I am missing something, but other outlets are reporting big increases for Nov new home sales? The MSM put into the headline the seasonal jump from October to November. A seasonal jump from October to November is fairly typical. That’s why I almost never mention month-to-month data because it jumps bigly one month then plunges the next month, and is totally irrelevant. Housing is very seasonal. And if the numbers are seasonally adjusted, they’re only as good as the seasonal adjustments. I focus on year-over-year comparisons, so November 2018 v November 2017. This eliminates seasonality. That’s why you should never take MSM headlines as info. Headlines are not designed to be info. They’re designed to get you to read the article. The info is in the article. But it seems you didn’t read their articles. You just read their headlines and then you read my headline, and then you felt confused. You have to read the entire MSM article until you get to the part where they compare November to November. And eventually they do. The NAR provided this year-over-year number RIGHT UP FRONT, because that’s the number that matters. If you look at my article you will see that I use the raw data and do my own charts from the raw data. This will tell you exactly what is going on. Did the MSM bots or college-grad newbies who write these MSM articles do that? Nope. A= Apartments , Condos, Flats.? B= Houses, Town Houses, Bungalows, Maisonettes ? Is this a difference that is relevant in this article ? Does the ‘single family houses’ in the context of this article mean A excluding B ? Also does every reader understand there is a different between ‘home’ sales and the price at which the ‘homes are sold ? Conceivably one could even go up when the other goes down, or visa versa. Meant to say B excluding A of course. It’s been a long day. A single-family house is a house for one family, and is “detached,” as it sits by itself on a plot of land. It doesn’t matter what style the house it. This article is about sales of these types of “homes” rather than other types of “homes” such as condos, townhouses, co-ops, TIC (in San Francisco), etc. In the US, we rent “apartments.” And we buy “condos” and “co-ops.” They may all look the same, but the ownership structure is different. Homebuilders’ actual earnings reports showed new home sales orders were very weak (negative order growth, lower prices) with the quarter ending in December. As Wolf noted, the month-to-month data is not the key. Year-over-year trend is more important. 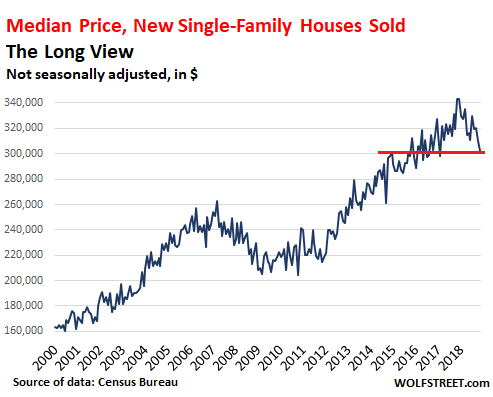 The trend shows that homebuilders overplayed their hand, and now the fun part begins where they attempt to reconcile their expensive product lines with actual demand in the market (affordable homes). This is not going to be a pleasant experience for many companies, because builders were intoxicated by the Fed’s liquidity punchbowl. Now comes the hangover…and we haven’t even hit the official recession yet. In Newport Beach, CdM, and Manhattan Beach, which are the 3 markets I know well, many many new homes are being built on existing lots. These new homes start in the 3Ms, and the builders are having a very difficult time getting the contractors lined up to build. There is no price decrease on these new homes. The trick is trying to find an old 3/2 in a good location for under two million. Those go fast. Yet there are people out there still thinking sellers as a group will hold out for a higher price. If nobody sells, prices will stay high they say. Yeah right. Tell that to a builder that has to make payroll. Tell that to a guy that is moving to a new city for a job. Tell that to the person who got laid off or divorced, or the retiree that needs to downsize. There are plenty of folks that need to sell. My last home in a near north suburb of Seattle had a nuber of new homes built outside my front door. Avge 3 car garage (2front +1 deeper), 3100 sq ft on postage stamp lots. Avge selling price was a whopping $1.2-1.3MM each! Of course these were selling when rates were their lowest. Now Seattle prices are dropping, rates are higher, and anyone who over-paid for their house better be prepared to live there a long time. This was the same mobility problem that occurred in the last housing bust. People who did not “bust out” became housing poor, and could not relocate for better job opportunities. No, home values are not dropping as average sales price drops. Dropping average sales prices just means cheaper homes are moving faster and higher-priced homes are moving slower. A market that had 100 homes sell over $500k and 100 homes sell under $500k, may now have more homes selling under $500k so the average sales price drops – yet each home may have the same or higher value. will show you that ‘price per sq foot’ is not dropping, except for a few places like Bellevue WA. Many markets have increasing price per sq ft with lowered average sales price. I agree William. I live in the Northern California east bay and while homes are not selling near as fast, the prices are not falling at all. Let alone back to 2014 numbers. I agree as well. 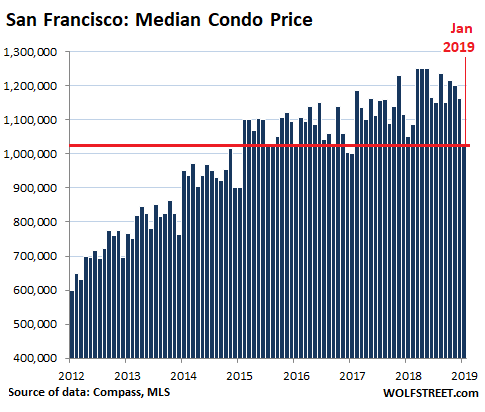 Condo prices are not falling in San Francisco as far as I can tell. I am beginning to think the blog is wishful thinking, as this market continues to defy gravity. I have been in the market for a few years now watching prices rise to $1200/sq ft. I thought we would see a reset with the new tax law, interest rate increases and business slow down. That hasn’t happened. Now I have to worry about the uber and Lyft ipo’s. Am I being too impatient? Wolf, can you plot condo prices per sq ft for one and 2 bedrooms over time? If more homes sell at lower prices, the take-away is that higher priced homes have become too unaffordable. That lower priced homes sell for more per square foot is meaningless. If you can only budget the mortgage payment on a $500k house, that’s just all you can buy. Period. So you’ll buy whatever option out there works best for you that’s available in your market. If that means you pay $236/ft v. $185/ft for a $700k home, you STILL cannot affird that $700k home. I recently looked at what few condos were for sale in a specific area in Seattle. Some were selling for more than $350/ft. But in their location and overall price range, some fool will buy them based solely on affordability. This home has been reduced by at least a 1/3rd. It’s actually been on the market longer than the history shows, i think. Nice 13k dollar tax bill. If you happen to live more than 20 miles from downtown of a major city yes your drop in home value is even larger than the 12%, but homes closer to the city are barley down across the board.